Worried about taking your prescription while you're pregnant? In most cases, they're safer than you think. Pregnancy is stressful enough in itself, but some women carry another burden—agonizing over the potential risks their prescription medications pose to their baby. As many as 80 percent of women take at least one prescription medication during pregnancy, according to a study by the Centers for Disease Control and Prevention. But ethical issues prevent risk studies in humans. Without definitive research about side effects for babies, moms are left scrambling for answers. The FDA recognizes this problem and is doing something about it. To provide prescribers and women with the most up-to-date medical information, the FDA changed its drug categorization labels as of 2015. "I'm very glad that the old labeling system is going away," says Anna Glezer, M.D., assistant clinical professor in the departments of psychiatry and obstetrics and gynecology at the University of California, San Francisco and founder of a new patient educational initiative called Mind Body Pregnancy. "That system caused fear, rather than prompting discussions about risks and benefits. We have to compare risks of the medications versus an untreated illness, which comes with its own risks." The only problem is, the experts predict the change-over to the new labeling system will take several years to complete. In the meantime, there are ways to weigh the risks and benefits to make the right decision for you. More than one in 10 pregnant women experienced major depression in the past year, according to the latest CDC survey. Commonly prescribed antidepressants such as Zoloft, Prozac and Paxil have no definitive human studies to show physicians whether they can be linked to birth defects. But if a woman isn't taking care of herself—missing doctor appointments or not eating well—that poses a risk to the baby as well. How to decide: Doctors advise that each woman needs to evaluate her history of depression. "We have to ask what is the severity of the symptoms," Dr. Glezer says, and added that a new study has shown that Zoloft poses very little risk of malformations for the baby. If you have a history of severe depression or have tried coming off the drug with a bad reaction, such as extreme lack of energy or an increase of suicidal thoughts, even attempting to go off your medicine could cause more harm than good. In that case, the benefits of the medicine outweigh potential harms. Plus, Dr. Glezer says taking an antidepressant can benefit both you and your newborn in the days following the delivery. "The medication can help with bonding in postpartum, which is needed for the baby's development." But if your depression has always been mild to moderate, or you started taking the drug to deal with a stressful life event, you might be a candidate for going off it completely. Research has shown that psychotherapy as well as other non-drug techniques like meditation or support groups can be as effective as antidepressants in some cases. About 1 in 200 people in the United States has epilepsy, and the disease is slightly more common in women. Epileptic symptoms vary widely, from mild—including feelings of nausea and unusual smell or taste—to severe—including loss of consciousness. How to decide: Your next step depends on which prescription you're taking. "There are some drugs we know we don't want pregnant women on," says Linda Szymanski, M.D. who is board-certified in maternal-fetal medicine and the medical director of labor and delivery and inpatient obstetric services at The Johns Hopkins Hospital in Baltimore. For example, older anti-epileptics, such as phenobarbital, have known risks for fetal malformations. But some newer medications are much safer, and the benefits outweigh the risks to the baby. If you're planning to get pregnant, make sure you're taking the lowest possible dose of medication to control your seizures. If you're taking an older antiepileptic, ask about switching to a less risky drug, such as lamotrigine, which doesn't increase any risk of malformation, says Lola Morgan, M.D., a neurologist specializing in epilepsy at UT Medicine San Antonio. Morgan also recommends taking significantly higher doses of folic acid throughout your pregnancy to help prevent malformations and birth defects. Asthma affects about 25 million people in the U.S., and attacks send nearly 2 million people to the emergency room every year, including pregnant women. The good news is that the methods of managing asthma are safe during pregnancy—no need to change medications in most instances. "We tell the ER doctors to treat pregnant women who come in with an asthma attack the same as if they weren't pregnant," Dr. Szymanski says. In fact, in an emergency, doctors will treat the mother first. When she gets better, the baby will get better. How to decide: Going off your medication would be much worse for both you and your baby. During an asthma attack, if a woman can't get oxygen for herself, her baby won't be getting oxygen either. Whether you use a rescue inhaler occasionally or if you take an anti-inflammatory every day, doctors say they're safe to use throughout your pregnancy. More than 10 percent of Americans have diabetes, and pregnant women have the added risk of gestational diabetes. The risk can be as high as 15 percent for obese women or those with a family history of diabetes. All women are screened for gestational diabetes at 24-28 weeks, and women with higher risk should be tested in the first trimester as well. How to decide: If you already take insulin to control your blood sugar, there's no need to make a change. It's safe to take during pregnancy, and you could put yourself at serious risk if you stop using it. "Research has shown that it's better to have your glucose level controlled than to be unmedicated," Dr. Szymanski says. "The health problem in the mom is much more important in this case. We know if your blood sugar is out of control, the chance for having an abnormal fetus is substantially higher. If your blood sugar is high in the first trimester, there's an increased chance of miscarriage or heart defects." If you develop gestational diabetes, you might be able to control the condition with careful diet and exercise. You'll need to check your blood sugar several times a day and pay attention to what you eat. But if those strategies can't keep your blood sugar in check, you'll need to take medication. But don't worry—insulin is safe, as are some oral drugs. About a third of Americans have high blood pressure, and while it's less common in reproductive age women, it's still a high-risk condition to have while you're pregnant. Certain medications, such as ACE inhibitors and ARBs, are especially dangerous for a developing baby, causing heart and kidney problems. 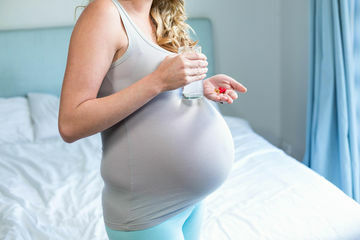 How to decide: If you're taking one of these types of drugs and are planning to get pregnant, you need to switch to a different medication, says Allison S. Bryant Mantha, M.D., a board-certified maternal-fetal specialist at Massachusetts General Hospital in Boston. She suggests choosing a safer option, such as beta blockers. Because blood pressure often decreases during pregnancy, some women might be able to stop taking the medication in the first trimester or until giving birth. Even lower levels of hypertension can sometimes be tolerated during pregnancy. But Dr. Mantha warns that a physician needs to monitor your blood pressure closely if you aren't taking medication, so don't stop taking it without your doctor's advice. In an ideal world, every woman would talk to her doctor before getting pregnant to discuss possible changes in her prescription. Of course, that's not always possible, since half of U.S. pregnancies are unplanned, and the drugs can affect the baby before a woman knows she's pregnant. The good news? "With most of these medications, complications are rare," Dr. Mantha says. If your doctor doesn't know the best plan for your pregnancy, find someone else—a genetic counselor or maternal-fetal specialist—who can answer your questions. Ultimately, you must not forget to take care of your own health while you're pregnant. "Women aren't just a vessel for pregnancy," Dr. Mantha adds. "There are two patients—mom and fetus."